I don't know about the languages that Montaigne was thinking of, but the claim that some languages lack a word for lying is one that has continued to crop up. A few months ago Steven Point, who is currently the Lieutenant Governor of British Columbia, asserted that there is no word for "lying" in his language, Halkomelem. It appears, however, that he is mistaken: my sources say that in his language smétnqən means "to lie, speak falsely" and that q̓íq̓əl̓stéxʷ means "to lie, deceive". An earlier example of the same theme is due to no other than John Wayne, who in the classic western Hondo asserts that "The Apaches have no word for 'lie'." That is sort of true: the Western Apache dictionary that I own lists not one but two different expressions for lying. There is a verb meaning specifically "to lie", e.g. ɬeíɬchoo "he lies", as well as an expression meaning "to lie, deceive", e.g. bich'ii' nashch'aa "I lie to him". It may well be true that these cultures have a particularly negative view of lying, but tall tales about the lack of a word for it aren't a good way of making this point. I'd be curious to know whether it's now possible to determine which New World language (or language-family) the "cannibal" that Montaigne interviewed in Rouen in 1562 spoke, so that the truth of his assertions about the lack (for example) of a word for lying could be checked. [Update: it was Tupinambá.] I'd lay my money against him, if there were any chance to settle the bet one way or the other. Mark has just supplied new Language Log readers with a reference archive of Language Log posts about languages with lots of words for certain things, and languages with no words for certain things. It is a theme that intrigues ordinary folk; it almost mesmerises them. It is clear that nothing Language Log can do will ever discredit the twin notions that (1) lexical abundance correlates with conceptual or environmental or perceptual richness, and (2) that lexical thrift betokens a poorer and meaner experiential world. "I actually have a pseudo linguistics question for you about the title of the Manchu emperor." The next day, my sister from Seattle, who was visiting us in Swarthmore after attending the inauguration in DC, happened to complain about this very usage of "actually" among our nieces and nephews and their friends (when they are expressing an opinion). Actually, these two senses of actually are worth distinguishing. And this is not just my opinion — I'm relying on the analysis in Uta Lenk's 1998 dissertation, Marking Discourse Coherence: Functions of Discourse Markers in Spoken English. I'm back, for the first time since August 2001, in Helsinki, Finland. I love this city, for all sorts of reasons. Intelligent and interesting academic friends; big, beautiful public buildings in brilliant white and yellow; the views across the harbor (hardly any of the sea is frozen today, so the big car ferries are moving with no trouble and the icebreakers are mainly up north); the comfort of the Hotel Arthur; but above all (for yes, this is Language Log, not Baltic Tourism Log) the coolest language in the world. Finnish seems wonderful to me. Delicious. Speaking the little bits of it that I can manage, or even just reading out signs, actually gives me a tingling feeling on the tongue. (Yliopistokirjakauppa: it tastes like iced champagne.) And I learned a tiny bit more about Finnish pronunciation within minutes of arrival. I thanked the taxi driver by saying kiitos ("Thank you") as I got out, carefully making the i twice as long as the o, which is what I thought was correct. But I clearly heard my friend Hanna, who had kindly come to the airport to meet me, say to the driver what sounded to my ear more like kitos. As soon as we got inside the hotel I asked her, what's up? Why was her first-syllable vowel shorter than mine? And like a solid linguist she was able to answer me instantly and authoritatively. Update (2009-06-09): See this post for arguably more accurate counts for dissertations. [W]hen someone makes a sociological point by saying that language L has no word for concept C, you'll rarely lose by betting that they're wrong. But a recent assertion by Bart Wilson seems more promising — the linguistic part is supported by reference to a chapter in a recent book by an actual (and eminent) linguist, and the socio-cultural part is supported by reference to a large body of empirical research, some of which was done by Wilson himself. We’ve had more than enough bad news lately about the economy, loss of jobs, fraud in the marketplace, and our various wars, so maybe talking about how to give bad news seems timely. Now CNN.com has published an article about the problems that law enforcement officers experience when it’s their job to give the bad news to relatives about murder victims and other tragedies. Giving the bad news is hard on the police. Some do it well; others don’t. But giving the ultimate bad news is necessary, no matter how hard we stuggle to do it. Most of us have to communicate bad news to suffering people at some time in our lives, whether it’s the type that police have to announce, the type that financial advisors have to give clients who have just lost their life savings in a stockmarket dive, or the type that physicians sadly have to give their patients. No bad news giving is easy. That is almost exactly what it looks like. Now, you tell me: would that mean that the projector is on, or that it is off? Is the blue button the operative one, showing the name of the current state? Or is it the white button beside it that we should pay attention to? (I should make it clear that the PAUSE across below them is not a button: only the ON and the OFF buttons change color when touched.) And then once we have decided whether we should see this as saying "ON" or as saying "OFF", do you think it means that the pausing function is on, which would mean that the projector is off? Or that the pausing function is off, which would mean that the projector is on? 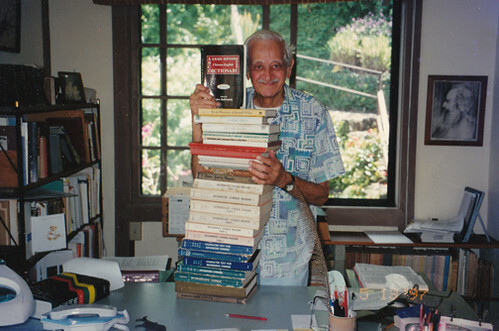 My old friend and comrade-in-arms, John DeFrancis, died at the age of 97 on January 2, 2009. The cause of his death was a bizarre, tragic accident, yet one that is supremely ironic for someone who devoted his entire adult life to the study, teaching, and explication of Chinese language: John choked on a piece of Peking Duck at a Christmas dinner in a Honolulu restaurant. 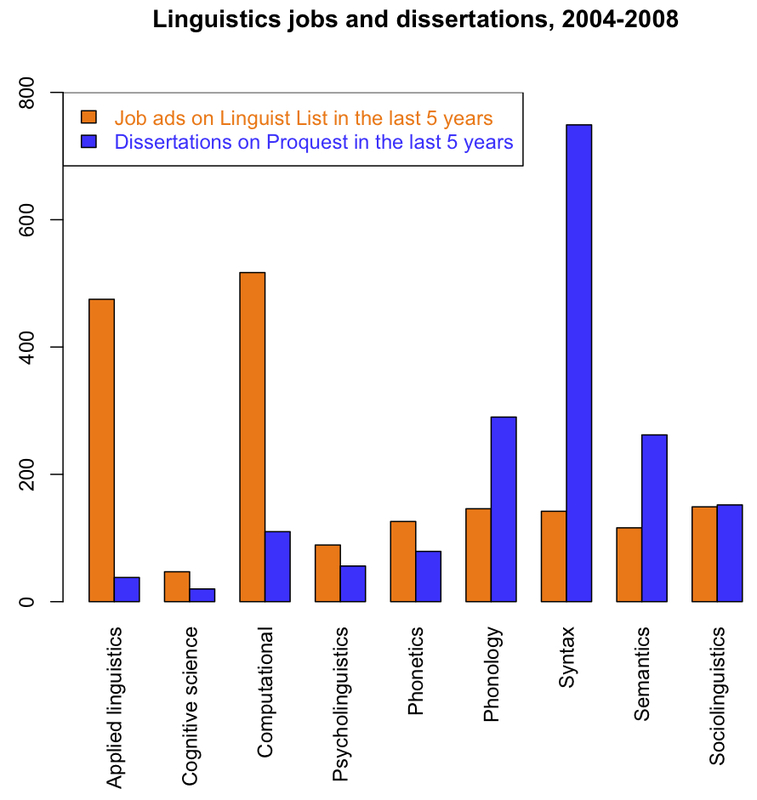 Chris's post on the job market for linguists circulated instantly here at the University of Arizona, and one of our enterprising recent grads, Shannon Bischoff, thought of comparing Chris's job posting numbers, sorted by area, to numbers of dissertations produced in each area. I post his revised table of figures including the diss numbers below the jump.